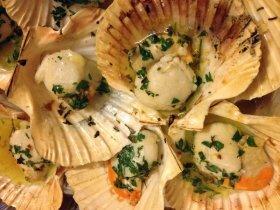 Easter lunch is approaching and so we suggest an idea really easy for a tasty appetizer served with a glass of Soave Scallops "alla Veneziana" (Venetian Style). scallops, garlic, parsley, lemon, white wine, olive oil, salt and pepper. Wash the scallops with plenty of water, then remove from the shell. Wash very well the shells and keep them aside. Mince garlic and parsley (about a clove of garlic and half spoon of parsley every 10 scallops). Put a glass of olive oil in a pan and sauté the chopped. Add the scallops, salt and pepper to taste. Cook for about 10 minutes on low heat with a little 'of white wine and the juice of a lemon. Then, place the scallops in the shells that you had kept aside and serve very hot. It usually takes about 3 scallops for each diner. You can garnish as desired with parsley sprigs. Taste them with a good glass of Soave.